Just a few weeks after the Catalan referendum that troubled many European governments, Italy's prosperous northern regions are going to vote for more autonomy -- especially for financial powers. Lombardy, Italy's richest region, with accounts for nearly a fifth of the country's gross domestic product, and its neighbor Veneto -- which generates about 10 percent of national GDP -- are holding referendums Sunday. The two regions, governed by the right-wing Northern League, are asking nearly 15 million people -- out of 60 million Italians -- for greater autonomy, not independence as Spain's northeast region of Catalonia did Oct. 1. 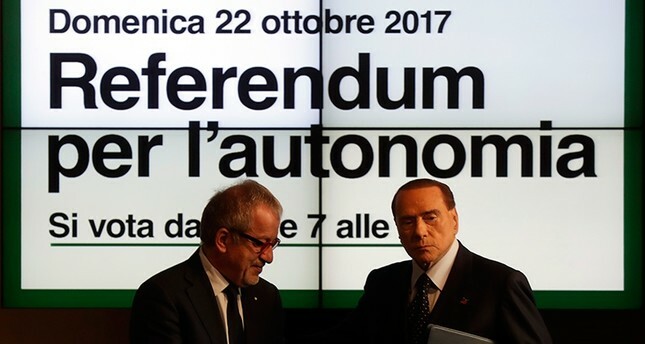 Also unlike Spain, Sunday's referendums have not been pronounced illegal by the courts because the Italian Constitution allows local authorities to demand more autonomy from the central government. Under Italy's complex governance structures, there are five autonomous regions, 15 regular regions and the peninsula is also home to the Vatican City and the microstate of San Marino. The cabinets of Italy's autonomous regions -- Sardinia, Sicily, Aosta Valley, Friuli-Venezia Giulia and Trentino-Alto Adige/Sudtirol -- have special powers on legislation, administration and financial control. Although all regions collect taxes, only autonomous regions can keep more of this revenue than 15 other regular regions -- roughly 60 percent instead of 20 percent. Such privileges -- especially controlling tax revenue -- are the biggest issues Lombardy and Veneto are fighting for. Although there is no need to carry a referendum to negotiate with the central government in Rome, the Northern League leaders of the regions may intend to win over public support before demanding talks. President of the Lombardy region, Roberto Maroni, who recently secured former-Prime Minister Silvio Berlusconi's backing for the autonomy drive, publicly said they do not want to feed the poorest parts of Italy's south. Another side, the Veneto region -- home of the touristic city of Venice -- held an online independence vote in 2014, which resulted in nearly 90 percent in favor but was declared unlawful by Italy's Constitutional Court. Veneto's president Luca Zaia‏'s previous call for secession was also blocked by Rome. Both leaders, therefore, have acted more cautiously this time in framing their referendum questions. Venetians Sunday will say 'Si' [Yes] or 'No' to a 14-word question -- Do you want Veneto to be given further forms and particular conditions of autonomy? -- while Lombardians must read a nearly fivefold longer question describing the legal basis of the vote. However, some voters in the regions took to social media to criticize the cost of running the referendums. Proponents of autonomy claim the eventual savings in tax revenues will more than offset the cost of the votes. In any case, the results will be non-binding.